I wonder if he had anyone in particular in mind? Hey, the Enquirer didn't get that Pulitzer nod for nothing. Professor - look ashamed - kicking a luckless lout when he's down - for now. 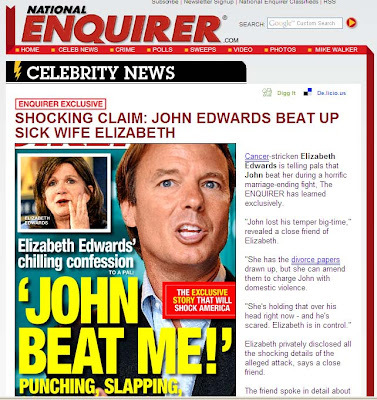 John Edwards deserves everything he gets for what he did. I have no compunction against the people who continue to call him out. I think Harry's wife should take the hint and leave. As soon as we eject that douche he might just get violent.